There are many situation when you want to execute a block of statements several number of times in your applications. Loops can execute a block of code a number of times. The for loop in Java is useful for iterating over arrays and for sequential processing. 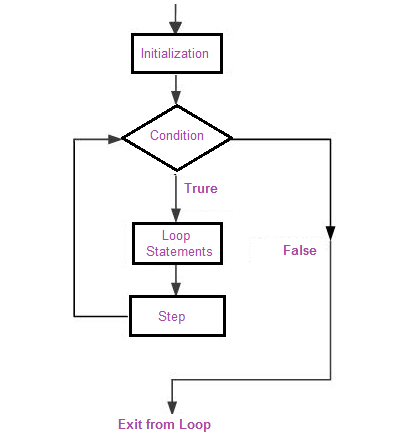 initialization: is executed before the loop (the code block) starts. termination: defines the condition for running the loop (the code block). increment: is executed each time after the loop (the code block) has been executed. The for loop initialize the value before the first step. Then checking the condition against the current value of variable and execute the loop statement and then perform the step taken for each execution of loop body. For-loops are also typically used when the number of iterations is known before entering the loop. For-loops are the shorthand way to make loops when the number of iterations is known, as every for-loop could be written as a while-loop. The initializer declares and initializes a local loop variable, cnt, that maintains a count of the iterations of the loop. The loop will execute four(4) times because we set the condition cnt is less than or equal to counter. All of the expressions of the for loop statements are optional. A loop becomes infinite loop if a condition never becomes false. You can make an endless loop by leaving the conditional expression empty. In the above code the loop will execute infinite times because there is no initialization , condition and steps . Check with the following enhanced for loop is used to print the elements of the array. In the above code, value of i is first initialised to arr i.e. 2 and the body of the for loop is executed which will causes the integer 3 to be printed on the screen. Next arr i.e. 4 is assigned to x and the body executed again. In this way the loop continues until all the elements are printed. Here, we can see the enhanced for loop is used to iterate through not just an array, but a collection in general.